I did see this come through on an E-Mail to me late yesterday afternoon. That President Bill Clinton had spoken to North Korea's leader Kim Jong-11 just hours and Eunda Lee and Laura Ling were freed and it said they could board a plane for the United States as early as Tonight (that was yesterday August 4th). Gotta wonder what Bill said??? Then in the Site, it did say that Clinton had flown out with the two reporters -- Great News after a long fought battle. Still very concerned about that Nuclear Testing.... Noted. A great publicity stunt for N Korea. This is great news but I wonder too what the conditions were for getting them released and brought back home. If all it took to get these two young women home to their families was a visit from President Clinton, then why not? This situation was expertly handled by our present administration and proves that perhaps in the future diplomacy is the way to do in all situations. Now, perhaps, we will find N. Korea more cooperative in all areas as this visit boosted their self esteem. Order of Good Hope Award. Nominated for Nobel Peace Award. Lifeaholics of America Award for Quarter Century "Working for a Life Not Just A Living". First President to visit Northern Ireland. 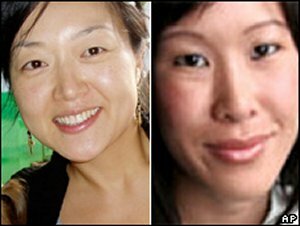 If these two women were innocent, which I believe they were,N Korea deserves no kudos for releasing them. Not sure if Bill Clinton does either.